Above: A veritable Le Metier de Beaute and Laura Mercier wonderland with a bit of By Terry and Surratt Beauty thrown in for good measure. 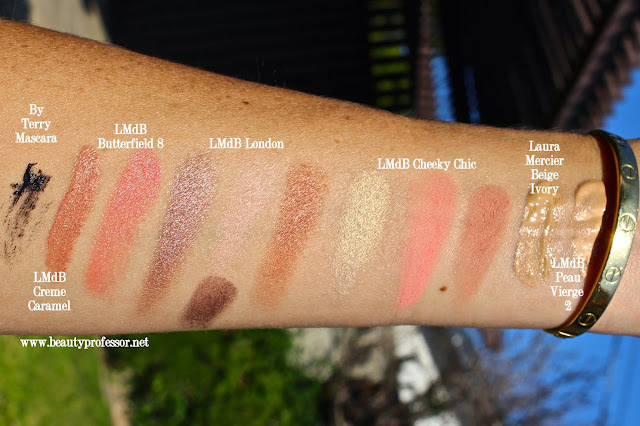 Last week, I shared swatches of the gorgeous, limited-edition Le Metier de Beaute Ken Downing Kaleidoscopes (full post HERE) and since then, I have procured the brilliantly neutral "London." Of course, I couldn't refrain from immediately creating an easy eye look that utilizes all for shades while still being totally daytime appropriate. I also found some time to swatch nearly every shade of the new Laura Mercier Photo Edition Silk Creme Foundations (available at Neiman Marcus, Nordstrom and Sephora) and am thrilled to share the fruits of my labor later on in this post! Above: The LMdB Ken Downing London Kaleidoscope features iconic images associated with the city. The LMdB Ken Downing London Kaleidoscope is every bit as absolutely dreamy on the eyes as I anticipated it to be and I am beyond glad I purchased a backup. Each of the four finely-milled and ultra-pigmented shades works in harmony to add depth, luminosity and richness and every color is one that can and will be used; I know that I will be wearing this quartet--which, by the way, doesn't crease or have fallout--nonstop in the coming months. As of publish date, this LE gem is still available on the Neiman Marcus site, but I'm told that stock is extremely limited...I suggest acting sooner rather than later should it captivate you as it does me! Exclusively ours. The enduring Le Métier de Beauté and Ken Downing relationship has yet again created an exquisite kaleidoscope collection. Distilled from the trends, tones and textures presented at the Fall 15 fashion week shows in London and Paris, each collection includes four limited-edition and specially curated eye shadows, with whimsical illustrations depicting iconic images of each city on each kaleidoscope. Shades can be worn alone or blended together for an incomparable result. 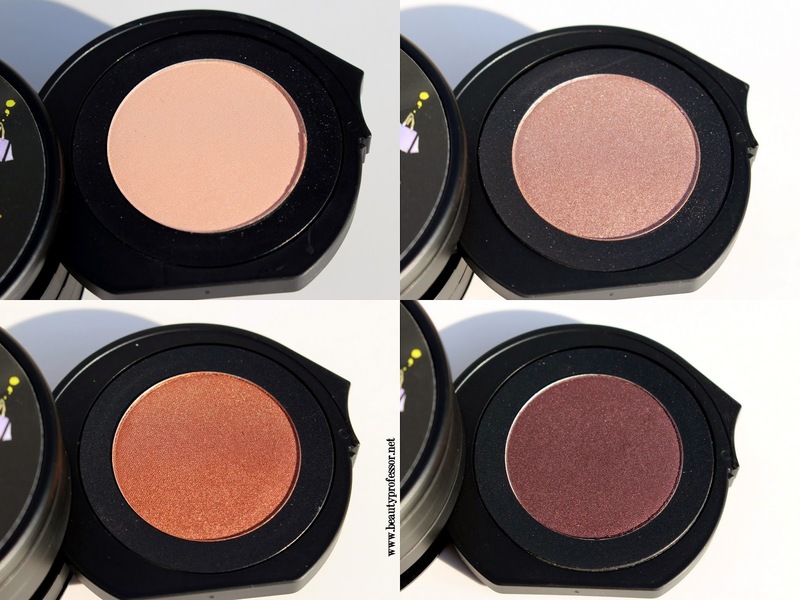 Above: Closeup of each of the four shades. Above: Swatches of London in direct sunlight. Above: I applied Penny Lane all over my eye lid and blended Naughty Nottingham towards my brow bone for a seamless gradient. I then used a bit of Faded Foxglove right below my brows to highlight and added a touch of Burnt Orchid in my crease. Above: The full result in direct sunlight (with a flash). Above: I adore the London Kaleidoscope. Above: The Laura Mercier Silk Creme Moisturizing Photo Edition Foundation. Additionally, I've been meaning to share swatches of the newest formulations of the Laura Mercier Silk Creme Photo Edition Foundation (available at Neiman Marcus, Nordstrom and Sephora) for quite a while and finally was granted a beautifully sunny window of time in which to prepare them! I have already reviewed the original Silk Creme HERE and now own the new formula in the Moisturizing version (it also comes in an Oil Free formulation). I was told by a Laura Mericer specialist that the shades in the new formulas are a bit different than the original (for reference, as one with @NC 25 skin, I was generally Cashew Beige in the original but my best match in the Moisturizing is Beige Ivory). Consequently, I swatched them according to their order as listed online but am not prepared to give exact shade descriptions as of yet; in the meanwhile, I hope my images will suffice! Does not flashback in photos (as demonstrated later in this post)...this is utterly fantastic! This photo-ready foundation creates a flawless, long-wearing canvas with a natural luminous finish. Shake well and apply a small amount with a sponge. Blend gently into skin for a flawless, luminous finish. Above: Swatches of the Laura Mercier Silk Creme MOISTURIZING Photo Edition Foundation in direct sunlight. This photo-ready foundation creates a flawless, oil free canvas with a natural matte finish. A long-wearing formula with a high pigment load that provides up to 12 hours of full coverage wear while feeling comfortable on skin and hiding even hard-to-cover imperfections. The photo-ready, natural matte finish is ideal for video, photography and special events. Shake well and apply a small amount with a sponge. Blend gently into skin for a flawless, natural matte finish. Above: Swatches of the Laura Mercier Silk Creme OIL FREE Photo Edition Foundation in direct sunlight. 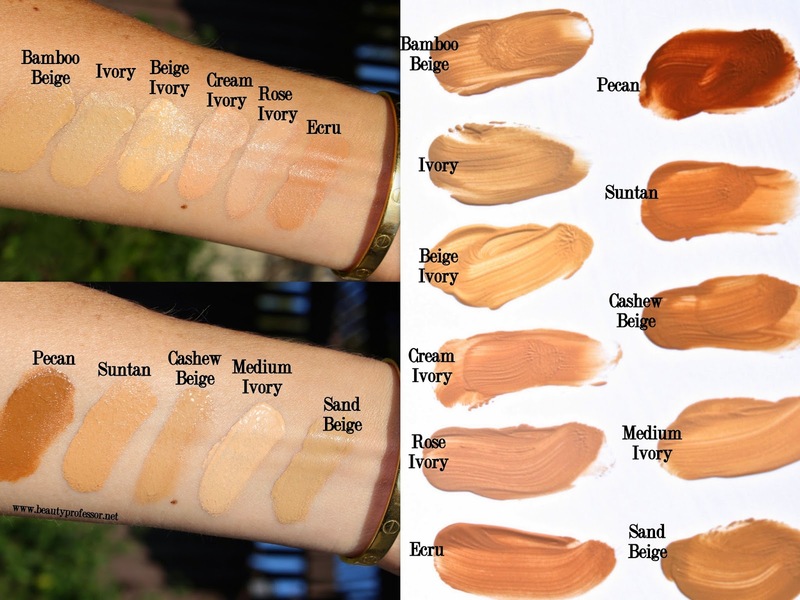 Above: My best match in the original formula was Cashew Beige...in the Moisturizing Photo Edition formula, it's Beige Ivory, which is just a touch lighter and less warm. To showcase both the Le Metier de Beaute Ken Downing London Kaleidoscope and Laura Mercier Silk Creme Moisturizing Foundation Photo Edition Foundation, I created a sunlit apricot-infused look that perfectly resonates with the warmer months...relaxed and glowing with a splash of subdued color. Le Metier de Beaute Peau Vierge #2 (reviewed HERE) as my non-negotiable first step. Laura Mercier Silk Creme Moisturizing Photo Edition Foundation in Beige Ivory buffed on with a damp Beauty Blender. Le Metier de Beaute Cheeky Chic Kaleidoscope (reviewed HERE)...I used the dusty rose shade to contour and warm the face and the bright matte peach on the apples of the cheeks. I also added the highlighting shade along the high points of my face. Le Metier de Beaute Ken Downing London Kaleidoscope (also discussed HERE)...I applied Penny Lane all over my eye lid and blended Naughty Nottingham towards my brow bone for a seamless gradient. I then used a bit of Faded Foxglove right below my brows to highlight and added a touch of Burnt Orchid in my crease. By Terry Terrybly Mascara (reviewed HERE)...two coats for length and volume. Surratt Beauty Relevee Eyelash Curler (reviewed HERE and available at Sephora and Barney's NY)...to add dramatic lift to the lashes. Le Metier de Beaute Hydra Creme Lip Color in Butterfield 8 (reviewed HERE)...for a moisturizing wash of apricot on the lips. Le Metier de Beaute Lip Creme in Creme Caramel...a gorgeous wash of rose gold gleam for extra dimension on the lips. 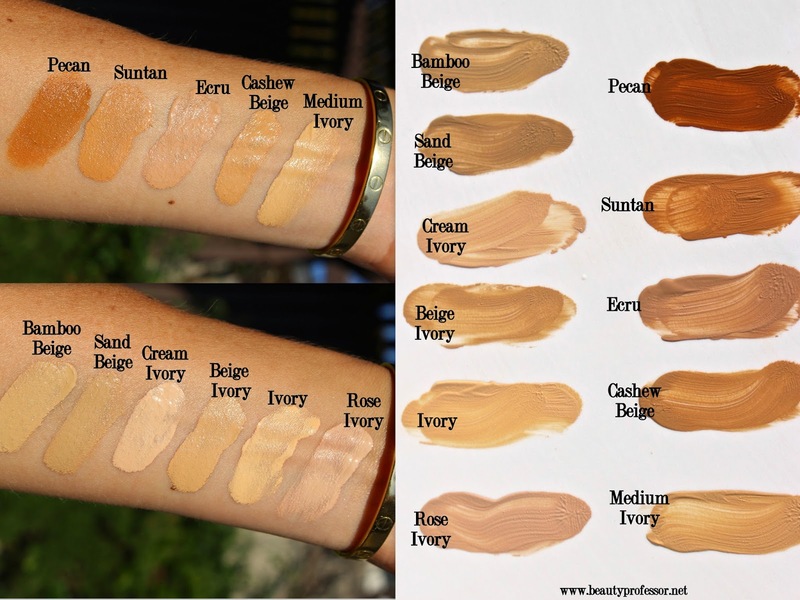 Above: Swatches of key products used in this post. Bottom Line: I hope you enjoyed my Le Metier de Beaute Ken Downing London Kaleidoscope closeup (run, don't walk, if you want this in your life!) and that you found the plethora of swatches for the new Laura Mercier Silk Creme Photo Edition Foundation helpful! Will YOU be trying either one? Good things ahead, including a skincare update, a video tutorial and some new lip color in my life. I've used the original formula of the Laura Mercier Silk Creme foundation in Cashew Beige as well, and it's by far the most natural-looking full-coverage foundation I've used. It withstood humidity while my BF and I were apartment hunting, and during a photography self-portrait project, it withstood various difficult-to-control lighting situations; in neither scenario did the foundation seem cakey or mask-like. Supposedly Laura Mercier herself has rosacea and developed th Silk Creme foundation with the need of covering it up in mind. Upon looking at the list of ingredients, I noticed a couple different kinds of silicones, and I think that's why I noticed the Silk Creme foundation wears well on me even when I've forgotten a silicone pore-filling primer beforehand, which may be why it photographs so well, given the limitations of most foundations in coping with uneven skin texture. I agree, TM! Thanks for sharing your experience and background knowledge regarding the LM Silk Creme...it does indeed work so well photographs. For me the only caveat is that it can feel a *tad* heavy at the end of a long day! Marvelous, Transientbeaute...hope you get it soon! Thank you for your en detail research, Rachel. I am not the biggest fan of the former formulation,because I do not find a perfect match for me.In the new one I am pretty shure, the ivory could be perfect. The lipstick...The color...I have a massive crush! I am on a search for an apricot blush and lipstick for ages! You know, a bit of an burned ( ? ), ( bronzey ) apricot color. I highly recommend the lipstick...Butterfield 8 is the perfect Apricot tone and the formula is so hydrating! I haven't bought LMdB since Butterfield 8 came out but I am going RIGHT NOW to buy London. It's GORGEOUS. That is fantastic to hear, Brooke!! I hope you love London as I do. I was generally not a fan of Laura Mercier because of the funky smell of one of her primers, but this foundation is right up my alley. I think Ivory might be a good match for me, and I love how yellow it is! I hope that it can sufficiently cover the redness in my skin. Thank you for the swatches! Anyway, I heard that Shiseido released a new foundation under their Future Solution LX line. Have you tried it yet? I heard it is marvelous, but I don't really trust the reviews on Nordstrom and on their website. I'm thinking of dropping by one of their counters this weekend to check out their new releases. I hope you're having a lovely week, Rachel! Thank you for all of your swatches! I will be prepared now because laura mercier just brought these new foundations to my country! Though it s getting really warm in here(mediterranean) i really want to try the moisturizing one because of my dry skin! It will be the first time to try a full coverage foundation! My pleasure! I am so glad that the swatches will be helpful for you and can't wait to hear what you think of the formula when you give it a try!